I’ve pretty much decided my next car will be a lightly-used Infiniti G37xS coupe. My gf is on board with this idea. I hit up my local Infiniti store to get more familiar with the car, and also drove an FX37 QX70 3.7, which I actually rather enjoyed. So I started looking at its discontinued big brother, the FX50S. 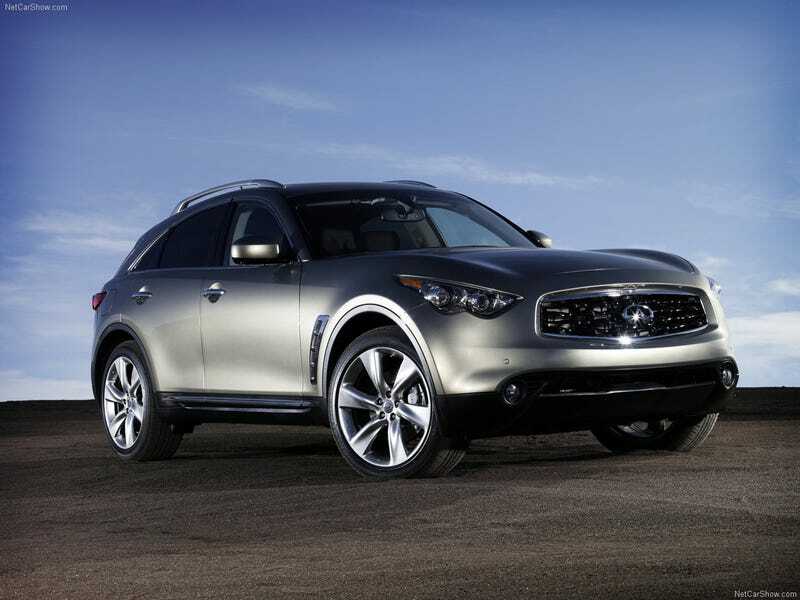 The FX50S is a rwd-biased awd crossover with a 390 hp, 5.0 liter V8, adaptive suspension, the optional big brakes from the 370Z/G37S, and 7-speed automatic with downshift rev matching. Oh, and it has my two favorite vehicle features: ventilated seats with extendable thigh shelves at the front. I love thigh shelves. I kinda enjoyed the QX70 3.7 because it’s actually pretty fun and tossable, but has the ground clearance for all of the ridiculously steep driveways here in Wisconsin, and is roomy for when I want to spread out some, like on road trips, or on my way home from the gym. Throw in a big honking V8 and the belief of the general public that it’s nothing more than a gussied-up Nissan Murano, and it’s the perfect incognito bruiser. The FX50S also comes with 21" wheels and the stock tire size is 265/45-21. There are three tires that come in this size: a snow tire, an all-season tire, and a summer tire. The summer tire is the Dunlop SP Sport 01, which in 265/45-21, costs $379.25 each at Tire Rack. Nope, I’m not going to be getting an FX50S. UPDATE: Well, I did a little more digging, and there are a few more options in 275/45-21 that are more like $275-$350 per tire. The Michelin Latitude Sport in 275/45-21 is $284 per tire, but back ordered at the moment. Which isn’t great, but at least that’s not quite as ridiculous as the OEM size. So....maaaaaaaaybe this changes things? That’s a good $360 less than the OEM size per set of tires.